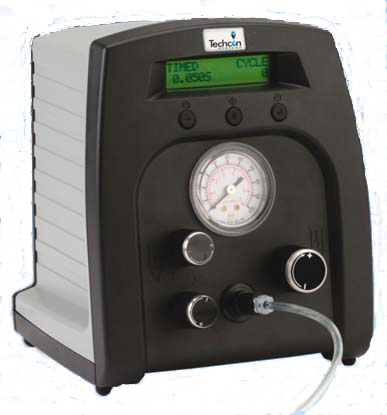 The TS250 / TS255 Series Dispenser/Controller dispenses low, medium and high-viscosity fluids accurately and consistently. These systems are economical, highly accurate and repeatable micro-air dispensing systems. These user friendly fluid dispensing systems include digital timer with rotary control time knob for easy setup, and a vacuum control for all viscosity of fluids. Packaged ready to use with a universal power supply, foot switch, air hose, sample tips, syringe barrel and adapter. Features a small footprint and is lightweight. Available in two versions of operating pressure: 0 to 100 psi (0-6.9 bar) for general applications, and 0 to 15 psi (0-1.0 bar) for specific low viscosity applications.